Whenever I travel, I´m always interested to know how much things cost and, every day, people from around the world find my blog by searching for the cost of living in Spain. 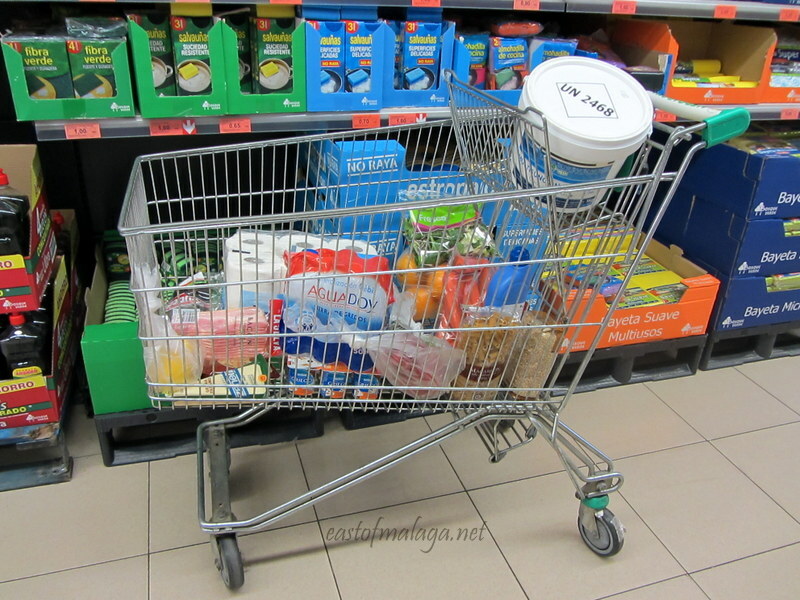 Back in August, I posted some receipts for groceries I had bought here in southern Spain, which proved to be a very popular article. I also wanted to do something a bit different, so I decided that rather than post the prices of random items of shopping that you may, or may not be interested in, I would come up with a list of standard grocery items, which I will update the prices of, three or four times a year. This list can easily be changed, so if there are any other basic items you would like me to include, please let me know in the comments section, below. This way, if anyone else wants to do something similar, we can have a direct comparison between countries. 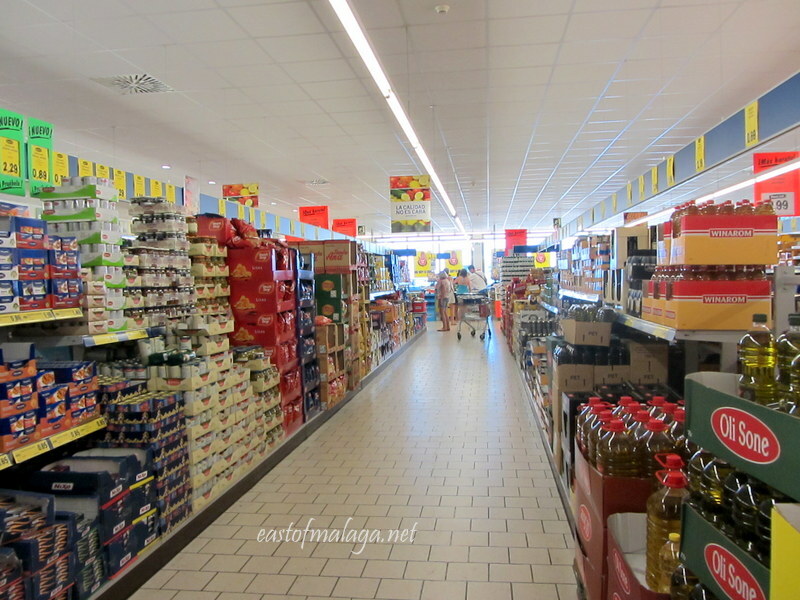 For this month´s prices, and to make direct comparison simple, I have once again used the Spanish Supermarket – Mercadona in Torrox Costa. I must admit – I was pleased that I had noted down these prices in August, or otherwise I wouldn´t have known about the pleasant surprise awaiting me – THERE HAD BEEN NO PRICE INCREASES AT ALL, AND MANY OF THE ITEMS HAD ACTUALLY COME DOWN IN PRICE! YAAY! This was even more of a surprise as there was a hike in IVA/VAT tax rates at the beginning of September. Whilst it´s fair to say that four of the price-reduced items are “seasonal fruit and veg” , six others are not, including a whopping 1.07 € off a packet of washing powder! So, here´s the Standard Grocery List I used last time (with prices as they were in August) – now with November´s prices in RED alongside. 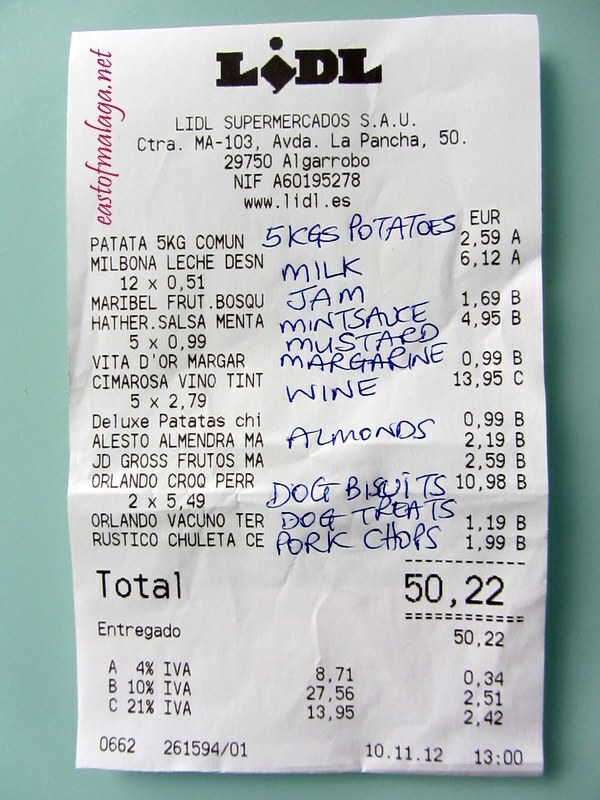 I´ve also included my store receipt for a few groceries I bought from the German supermarket Lidl which has stores throughout Spain. Most of these items not included on my standard grocery shopping list. Gas: We don´t have mains gas here – we use bottles of butane gas. In August, a 12.5kg bottle of Butane gas cost 16.45 € – they are now 16.10 € . One bottle used to last (on average) 21 days (for two people… though around 4 weeks in summer) for all hot water, showers and cooking. During September we had a new gas water heater fitted and, even though it has a larger capacity for water heating than the previous one, it appears to use significantly less gas. It´s early days yet, but the first bottle lasted five weeks (rather than three weeks). I´ll keep my eye on how that goes. Electricity: Last time I told you that for a 3 bedroom/2 bathroom detached house in the countryside with a swimming pool, we paid an average of 90 € per month. I may have underestimated this a bit. The cost of consumption for us is slightly lower in winter with heating/lighting, as opposed to air conditioning/lighting/swimming pool pump running for 8 hours a day, in the summer months. Our electricity company Sevillana Endesa has raised their prices significantly recently and monthly bills now appear to be averaging 120€. Water: We are not connected to mains water, so when we bought our house part of the purchase cost was for a share in a local water company. We have a water deposit to store our house water. Our water share gives us an allowance of up to 17,500 litres of water each week at reduced cost, after which the price rises steeply. Needless to say, we don´t use this amount of water, even allowing for swimming pool top-ups and garden irrigation. The water company, Patamalara, doesn´t always sent out their bills regularly and much of the cost appears to depend on the amount of repairs that have been undertaken on the system, but over the past twelve months our annual water bill has amounted to 92 €. Vehicle excise duty: We have a Peugot 307 and pay 51 € per year. How do prices compare where you live? This entry was tagged Andalucía, cost of living, East of Malaga, Europe, Food, life, lifestyle, Malaga, shopping, Spain, travel. Bookmark the permalink. how much for a manicure and pedicure? Womans hair cut wash and dry? Thanks so much – I’m honoured that you considered my blog worthy of such an Award. Hey – loving the new look at your blog, BTW! I’m absolutely shocked at the price difference moving from Canberra to Cairns. Everything is SO MUCH CHEAPER in Cairns its amazing! You would think because Cairns is so far away from other major cities everything would be more expensive. But it seems Canberra and Sydney are ridiculously overpricing. Hey that’s good news, Dianne – and yes, you would think it would be more expensive being further away. It just goes to show that things aren’t always as you might expect. Interesting piece Marianne. I compare prices from one store to another in my location. Certain items are better bought in bulk, but when it come to fresh ingredients I go for the best and not necessarily to expansive markets. I agree that certain items are better bought in bulk, especially if they are items that you use a lot, or if prices are more favourable in larger quantities. For the purposes of comparison, I have used the Spanish supermarket Mercadona, but I probably only buy about one third of my shopping there and Lidl for another third. The rest I just pick up as I go along. We have some great markets – both street-markets in most villages and towns, or municipal markets in some of the larger towns or cities. I think my favourite place to buy fruit and veg is on a trip into Málaga city to the main Atarazanas market. It´s always a delight to buy the fresh, locally grown produce there. I love markets in open street markets, farmers markets and local stores. I hardly shop in supermarkets. Up here In Lorca your car would cost around 150€ to tax ! Oh dear – that´s expensive, Gus. Is that for a similar car or one with a bigger engine? I’m so glad you made a comparison, Marianne! I had noticed that before the prices in Eroski and Mercadona were nearly the same, but now Eroski has become much more expensive, and even some things that I used to buy at Eroski because it was cheaper there, have now become cheaper at Mercadona than they used to be (like olive oil). The downer is that Eroski is right in front of me while I have to walk about 20 minutes to get to Mercadona! 😦 And before I didn’t used to do that, because the prices being nearly the same made it not worthwhile for me to go out of the way to walk to Mercadona. But now I pretty much HAVE to! I’m glad there is Mercadona, though (and Lidl! Love those German pastries………). That´s very interesting to know, Serena, as I don´t use Eroski – so I couldn´t comment on their prices. I noticed there were lots of “special offers” and “price drops” in Mercadona – so maybe things will change once the offers drop away. Interesting piece Marianne. Mercadona’s prices were never going to increase because of the IVA hike.They make their supplier pay the cost(it is common supermarket practise to push certain costs onto them or at least until the following year). I have sold to supermarkets both here and in the UK and this is one of their ways of being good to the consumer but crippling their middle-size and smaller suppliers. Looks as if the olive crop is going to be down 15 to 25% I saw somewhere so the price of olive oil will do its normal thing in these circumstances and rise quickly next year!! I heard that the bigger supermarkets weren´t passing on the IVA to customers (at first), but I wonder how long this can be sustained. I guess we will just have to wait and see what happens next year. Our prices seem to be fluctating esp. fruit & veg but more expensive in general than Malaga. I think its due to seasonal fluctuations that our oranges, bananas and apples are cheaper at the moment. Probably the same with petrol, now that the bulk of holiday makers have gone home, the price drops a little. Time will tell. But over all, prices in Sydney are most definitely more expensive than southern Spain. Thanks for doing the comparison it´s really interesting! Well of course you know how much we pay to exist in the UK! It’s no wonder we all live in small basic homes because our council tax for instance is £130 a month – and I mean a small house! water £80 a month for two people, toilet rolls pack of 4 own brand £1.80 – 2.40! You know what, Gilly, Council tax is one of the bills I am very glad to have left behind me. It is a real crippler for families in the UK – and you seem to get so few services for your money. Will be getting out my BIM (Turkish LIDL equivilent) in a bit to compare! Although I have to add that none of the staff in any of the Turkish supermarkets including Carrefour, are big smilers which makes the whole shopping experience that much more pleasurable. Supermarket staff here in Spain are generally neither very smiley or very sullen. They mostly just do the job and get you through the tills. At least there is none of that nonsense they now practice in the UK with their very false, “How is your day going today?” or “Sorry you´ve had to wait thirty seconds in the queue, Madam, but we´re so glad you are shopping with us today”. I can´t stand all that, as it´s clearly what they have been told to say, and it´s usually said with about as much feeling as a dead fish could muster! Like they would let me loose on the general public! I do have a very nice walkie talkie though and I keep broadcasting to the security guard “beam me up scottie” who I’m afraid doesn’t share my sense of humour! I tell you only one thing which explains then everything else concerning the cost of the products. Gasoline in Italy was 1.8 €/lt! Fee for the car, Clio 1.2, 120 €! Yes, I heard that the price of petrol in Italy is the most expensive in Europe. It’s much better in Spain right now. muy interesante 🙂 I think I said this before but I’m so glad you’re doing this! It will help tremendously when we get to the point of figuring out our budget. Is that your house with the beautiful plants out front? I just love that photo…and want to be there! Thanks again for doing this. You´re welcome and I´m glad it will help you with your budget for when you want to move to Málaga. No, it´s not our house, Toby. This is a house in the local village of Torrox. 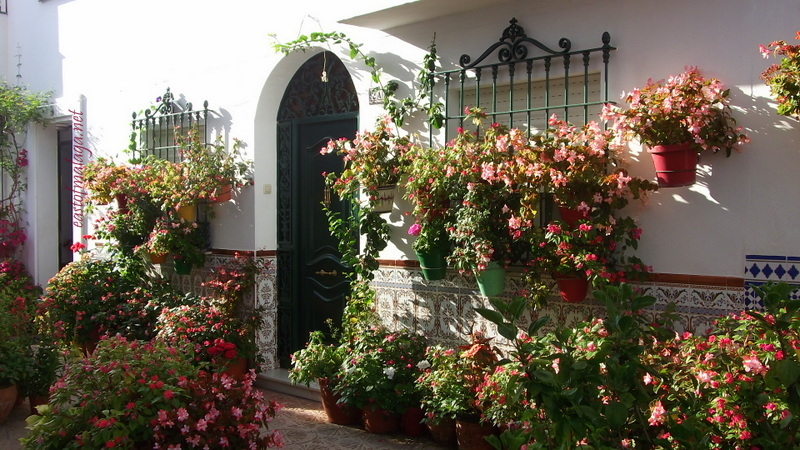 It´s always so pretty with all the pots of flowers outside. I keep meaning to compare Spain and Gib but still haven’t done a post! The trouble is the prices change so much within the seasons. Your luz bill is amazing. We pay between 10 and 20 a month. But we don’t have a pool or air con. We are on mains water but that doesn’t equal a hundred a year. Our communidad has doubled from not much more than a hundred to nearly 300. Next time I´m in Morrisons in Gibraltar (won´t be until next year) I´ll make a note of the prices there too! We don´t have any communidad fees here, but it´s interesting to hear about yours. Sorry split life syndrome. Communidad is here in Gib and is a similar figure. I meant IBI ie contribución when I referred to the nearly 300€ sum. I don’t pay communidad in Spain, but I pay that and rates in Gib. Still not expensive although a far smaller property. That is really interesting and goes to show how mass hysteria influences a nation. While it can not be denied there is more unemployment etc. the media gives the impression that everything is more expensive, and contributes to the sense of despair. I totally agree Yolanda – and without having already made a list in August with which to compare, I would have sworn that prices had actually risen. It will be interesting to see how prices pan out over the coming year. Nicely done. THe price of apples surely went down! That´s right – but look how much the washing powder went down! I wonder if they mis-priced it last time. There are a lot of special offers in Mercadona at the moment. Update time already? Dear me, Marianne, I’ve only got as far as putting some slips into a little folder at the side of my desk! This makes such interesting reading, especially when I compare to Sri Lanka – I’ll have to try to be a bit more scientific than anecdotal and see what I can put together. Oh, my goodness, everything is so much cheaper there than here (Seoul)! I’ll have to make a list of your groceries for comparison, because I rarely do a big shopping trip, since I have to carry it all home. I can tell off the top of my head that I pay about 4 euros for a block of butter, but it’s French, because Korean butter tastes like margerine. I also saw yesterday at the big box chain that 6 apples (the one variety generally available) were on sale for about 4 euros as well. That’s a pretty good deal, here. €4 for a block of butter – wow, that´s expensive, Jen, but then again, if I was to look for non-Spanish butter I´m sure it would be more expensive than 0.98€. Is the Seoul generally an expensive place to live? It’s much more expensive than it was five or so years ago, but that’s partly because options have increased and the better options are more expensive. My BF and I love cheese and lamb, so we stock up on trips to the UK, because the prices here are ridiculous– in part because neither are part of the traditional Korean diet and in part because “foreign”= expensive here, even if it needn’t be, such as locally grown lamb being sold for 2-3 euros per 100g (bone in). On the other hand, electricity and internet and other services are extremely cheap. We pay about 15-20 a month for phone/ cable TV/ internet with 100mbps unlimited downloading. Electricity, gas, and water are paid together and run between 75-150 euros a month depending on the season (ac is much more expensive than heat).